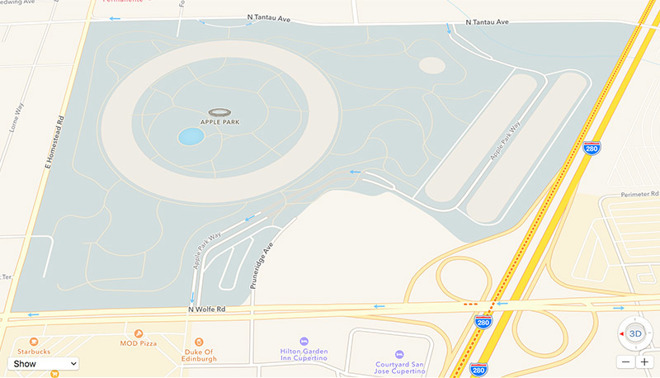 Apple in a recent update to Apple Maps enhanced coverage of the Apple Park campus area in Cupertino, Calif., with the app now displaying 3D building models, walkways and other points of interest across the sprawling grounds. 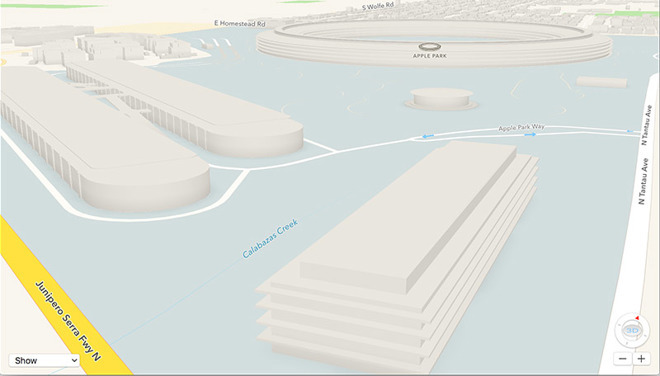 As seen in the screenshot above, Apple Park data now includes a comprehensive "Map" view with highly detailed 3D building models, roads running into and out of the campus — complete with traffic directions — pedestrian walkways and more. The map even shows a small manmade pond that sits within the walls of the main "spaceship" building. While the Steve Jobs Theater is labeled with its own Maps informational tag, the ring-shaped office building is not. Ancillary buildings like the R&D facility, fitness center and above ground parking structures also lack labels. Apple first added Apple Park mapping data to its Maps app in March, offering interested users a sneak peek at the campus through satellite and drone imagery. Those images have not been updated and still depict the facility as it appeared during construction. The latest drone footage of Apple Park reveals a campus nearly ready for employees to move in. As of last week, contractors were putting the finishing touches on exterior work at the central office building, though furniture had yet to arrive. Landscaping is also largely incomplete, though workers are making steady progress toward planting the 9,000 trees that will ultimately cover the campus grounds. Employees have already started migrating into certain areas of Apple Park, including the R&D facility. More than 12,000 workers will make the move in a process expected to take six months to complete. Designed in collaboration with architectural firm Foster + Partners, Apple Park is the brainchild of late Apple co-founder Steve Jobs. The campus is being built on a former HP facility, replacing 5 million square feet of asphalt and concrete with grass, local vegetation and intelligently designed buildings powered by sustainable energy sources.